Italian Oregano is a cross of Oregano and Marjoram and has a mild flavor that blends well with other savory herbs like Basil and Tarragon. The sadly neglected Italian Oregano below is actually a good representation of how it grows. Notice the really long dead flower stems arching out in all directions. These stems, when they are green and have fresh flowers, are good for covering wreath bases. They can be used alone to make an Oregano wreath for the kitchen or in conjunction with other herbs to create beautiful one of a kind works of art. 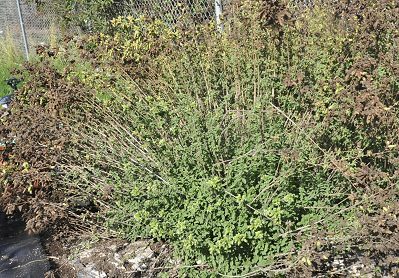 Even though this Italian Oregano plant hadn't been cut back for a few years it was easy to cut back and reemerged looking great. Technically Italian Oregano can be cut back to the ground. 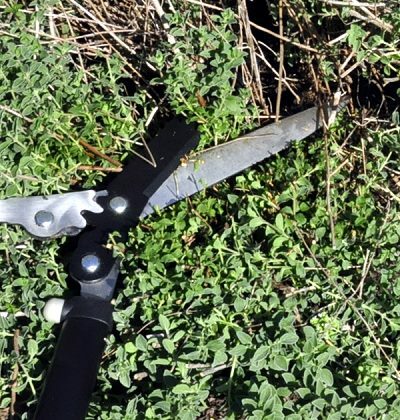 Often when we are trimming oregano in the field we will use a weed eater and cut it back to about an inch. But with one as old as this we usually only cut back to where the main mass is. For this plant that was at about 10 inches. We take our grass sheers and find the top of the tuft and cut back to there. It takes about two or three weeks before new growth covers the plant and it both looks beautiful again and has usable leaves once again. If it is too cold in your area to keep Italian Oregano outside in the winter, try growing it in a container. Place it outside through the growing season and bring it indoors before the first frost. Read our Growing Herbs Indoors page for more information on this. 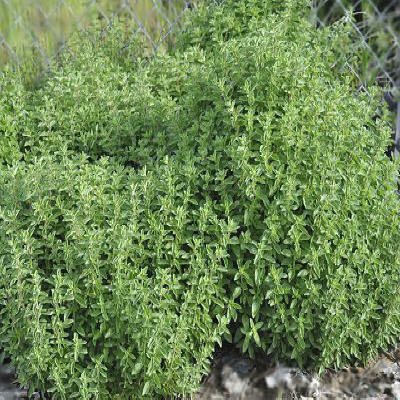 Italian Oregano is one of the six plants chosen to be in our Small Space Herb Garden Six Pack. This plant is often available in plug trays. These trays hold 128 of all the same plant. They are a great low cost way to fill a lot of space. Each cell is 3/4 of inch by an inch. Check here to see if Italian Oregano Plug Trays are available.